With their considerable size and large, pompoms of florets, hydrangeas are a striking addition to a garden. Hydrangea flowers can come in both pink and blue. The different colors are not because they are growing on different varieties. Both colors can come from the same plant. Which color grows can actually be controlled, to some extent, by you. When it comes to determining the color of a hydrangea flower, it depends on what minerals are in the soil. The plant will take up the minerals through its root system, transporting it through the plant and eventually to the flowers, where they affect the color of the flowers. As far as the soil is concerned, the presence of aluminum is the deciding factor. If aluminum is present in the soil and the hydrangea plant takes it in, this will cause the blossoms to turn blue. If the plant can not absorb the aluminum from the soil or if there is no aluminum to absorb, the blossoms will be pink. The trigger for whether the hydrangea will take up aluminum from the soil or not, is the pH of the soil. If the soil is more alkaline, above 6, the aluminum is not absorbed. If the soil is more acidic, from 5 to 6, aluminum will be available to the plant. This is where coffee grounds come into play. Coffee grounds are highly acidic. 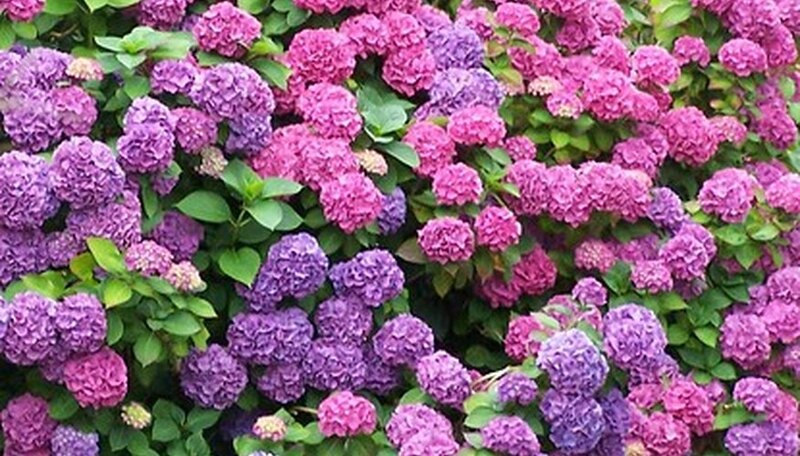 As an organic component, they can be worked into the soil around hydrangeas to safely change the pH of the soil. If you have pink hydrangeas, you can add aluminum salts to the soil, along with coffee grounds. The change in pH will allow the plant to take in the aluminum and turn the flowers blue. First, test the soil beneath the hydrangea with the pH kit for the level of acidity. If your hydrangea has pink flowers, it is likely that the pH will be above 6. Add a solution of 2 to 3 Tbsp. of aluminum sulfate for every gallon of water. This will ensure that there is sufficient aluminum in the soil. Turn the soil around the hydrangea, being careful not to injure the roots. Add the coffee grounds to the soil, working them in. Test the soil again to see if the pH is between 5 and 6. If not, add more coffee grounds and test again. As time goes by during the growing season, you will notice the color change.